The music of the TRANSFORMERS trilogy is probably not what one might expect to be given a re-recording and compilation treatment, especially seeing as the final part of MICHAEL BAY’S trilogy is merely months old. Yet here is LONDON MUSIC WORKS own interpretation of JABLONSKY’S music for the trilogy. 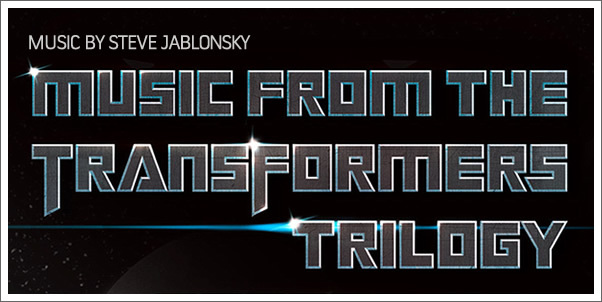 MUSIC FROM THE TRANSFORMERS TRILOGY consists 17 tracks in total, and those who have followed JABLONSKY’S work in the series will immediately notice that the tracks chosen are certainly the highlights of the three films’ musical offering. This is perhaps the greatest incentive for anyone deliberating over whether to purchase the album. The compilation stands as a useful overview of the music across the three films, enabling listeners to hear the high points and providing assistance in generating an overall opinion of JABLONSKY’S work should one be needed before taking the plunge into the trilogy’s individual soundtracks. Therefore it comes as no surprise that this album is perhaps unsuitable for those who have already experienced the previous three score albums in great detail. As pleasant as the recordings on the album are, they offer very little beyond JABLONSKY’S original recordings and are subsequently a concrete recommendation only for the most devout of Transformers music fans. One of the pitfalls of re-recordings in film music is the failure to live up to the original. The recent release of HALO: COMBAT EVOLVED ANNIVERSARY is an example of the reinterpreting of a strongly established original musical journey that brings with it legions of dedicated fans. Such was the strength and iconic nature of the HALO score; it was always going to be difficult to live up to the original. This is not the case for MUSIC FROM THE TRANSFORMERS TRILOGY however. There are distinctive differences that are immediately noticeable, but the orchestral performances on offer are consistently sufficient in resurrecting vivid mental images of the Autobot’s clashes with the Decepticons.